At Atlanta’s two Ronald McDonald Houses, families can enjoy home-cooked meals, private bedrooms, playrooms for children, special suites for children with suppressed immune systems, evening activities and the unconditional love and support from caring staff and volunteers. 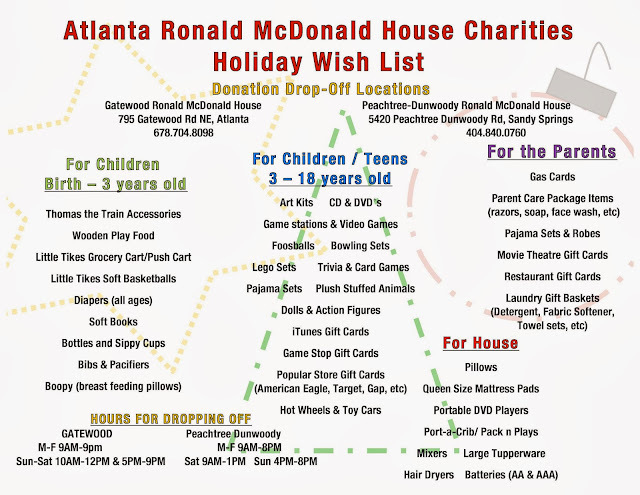 This holiday they are collecting holiday toys and other items for their two Houses! Please review their holiday wish list. With your support, families staying at one of our two Houses will be able to celebrate the holidays together. Thank you for collecting these much needed items for families with ill and injured children!